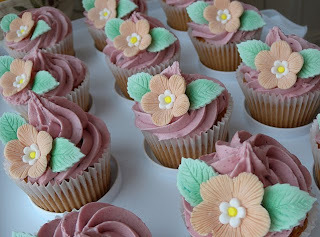 These are my Shabby Chic vanilla cuppies with Blueberry and Strawberry buttercream frosting, which I made for my monthly management meeting at work yesterday. I really need to work more on my flowers, I tend to go for the funky, brightly coloured, flat variety (see Kim's cake below) but I do love the more delicate shapes and textures like these beautiful examples by cupcake d'lights. This was my first time using a veiner to create the texture on the petals and I was relatively happy with the results, but to achieve that 'posy' look I now need to invest in some more cutters in a variety of shapes and sizes. Looks like I'm off to Norwich again this weekend!